Occasional Brief Observations: Did they say that? 2. Location: New York. A construction worker who is a Boston Red Sox fan buried a jersey of his favorite team in the concrete of the new Yankee stadium “to curse” them. Apparently he couldn’t keep his mouth shut; the Yankees found out and dug up the jersey. Yankees President Randy Levine said "The first thought was, you know, it's never a good thing to be buried in cement when you're in New York. But then we decided, why reward somebody who had really bad motives and was trying to do a really bad thing?" Levine said the shirt would be cleaned up and sent to a charity affiliated with Boston's Dana-Farber Cancer Institute. "Hopefully the Jimmy Fund will auction it off and we'll take the act that was a very, very bad act and turn it into something beautiful," Levine added. Really bad, very bad! 3. 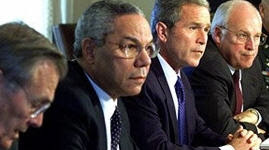 Colin Powell exited the Bush administration with his reputation slightly tarnished (by his UN allegations of Iraqi WMD that turned out to be chimeric) but mostly intact. He then remained mum, avoiding any criticism of the Bush administration. However retired U.S. Army Col. Larry Wilkerson, Powell’s chief of staff from when he was Secretary of State, made a splash when he came out strongly against poor treatment of detainees; laid responsibility at the door of Vice President Cheney; and said that Powell had no first-hand knowledge of how abuse/torture had come about. His views were taken as reflecting the views of Powell, and (see linked article below) “in many ways Wilkerson's sizzling speech was a vital part of the effort to preserve Powell's legacy and indicate that he didn't sign off on the administration's efforts to institutionalize soft torture techniques or ignore the Geneva Conventions…. Wilkerson saved Powell's reputation in the eyes of some people…” Powell did not agree with or deny Wilkerson’s characterization. Now evidence has come out that mistreatment and ‘enhanced interrogation techniques” i.e. torture were discussed in precise detail at the Principals meeting, of which Powell was a key part. When asked re this Colin Powell said that he didn't have "sufficient memory recall" about the meetings & that he had participated in "… many meetings on how to deal with detainees…” & “…"I'm not aware of anything that we discussed in any of those meetings that was not considered legal…” Way to go!